The older I get the harder it becomes to see positive traits in the human race, to see beyond the war, abuse, selfishness and greed recounted in news headlines. No wonder more of us are retreating into our own little worlds. But a touching story I heard recently about the love between an old man and a stork reminded me of the self-sacrifice humans are also capable of. Croatian Stjepan Vokie has devoted the last 24 years to care for a disabled stork, Marlena. He found the injured stork one day when he was out fishing. Her wing was damaged by a gunshot and she can no longer fly or feed herself. Stjepan goes fishing twice a day to catch fresh fish for Marlena. He also helps feed the numerous chicks fathered each spring by her mate, Klepetan. Klepetan migrates south to Africa every winter but sadly Marlena cannot join him. Instead she spends the winters with her human best friend watching wildlife films on TV and riding in the car down to the river for a spot of fishing. In the wetland area where this odd couple reside storks are popular. Nearly every roof in the village has a stork’s nest and according to superstition the beautiful white birds bring luck and children to a household. Stjepan has even built a ramp so that Marlena can walk up to her own nest on the roof! Disability rights for birds…right on!! Another good news story about animals comes from Russia. Siberian tigers poached nearly to extinction seem to be making a comeback thanks to the personal interest and intervention of President Vladimir Putin. “A recent census found as many as 540 Amur tigers living in Russia’s eastern forests, according to the World Wildlife Fund (WWF). That’s an improvement over the last count, in 2005, which found between 423 and 502 of the tigers. In the 1940s, their numbers were no more than 40. 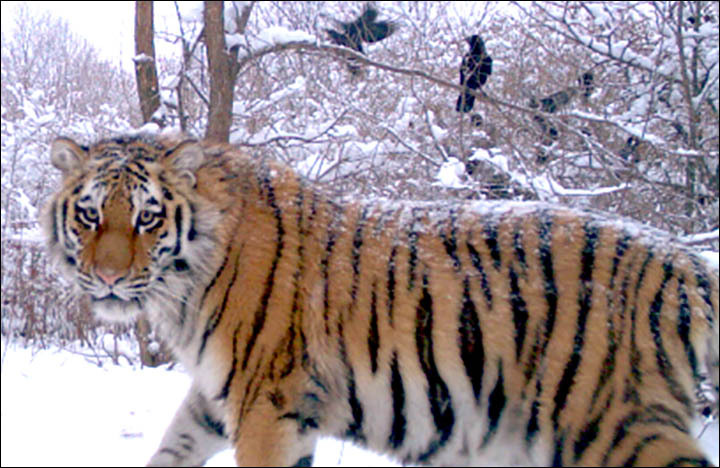 But due to poaching and habitat loss, they’re now confined almost entirely to Russia’s Far East, where the few remaining tigers roam a vast area of nearly 700,000 square miles, about the size of Alaska. Legal hunting in the 19th century drove their numbers down so badly that by the end of the 1930s, when a Russian biologist conducted the first survey of the species, less than 30 of them remained on the planet, according to the Wildlife Conservation Society (WCS). Russia has had strict anti-poaching measures in place for at least the last two decades, Long said, and has taken additional measures in recent years to create new parks and protect the tigers’ prey animals. In 2010, the country banned logging of the Korean pine, which provides food for the deer and boar that tigers rely on to survive the harsh winter months. There’s more good news for wildlife lovers from China where the number of giant pandas in the wild has increased by 16.8 percent over a decade between 2003 and 2013. The hard work and dedication of conservationists in China has made a difference and the status of the giant panda has now been upgraded from “endangered” to “vulnerable”. Successful Chinese government strategies include the creation of 13 nature reserves, subsidies for farmers, encouraging foreign NGOs to study pandas and loaning pandas to foreign zoos to raise more money for further conservation initiatives. The giant panda has long been a symbol for wildlife protection around the world. Years ago I worked for the World Wildlife Fund as a fund raiser and the panda was our famous emblem. Panda stickers, badges and posters were popular with the public. We had a small but dedicated group of volunteers in our area who spent weekends standing in the rain rattling collection tins, running cake stalls at village fetes, doing sponsored walks and supporting charity concerts. I have a quirky memory from that era. I needed to borrow a large plastic panda with a coin slot in the top of his head from another group for a fundraising event. It was the sort of kitsch object you used to see sometimes on the pavement outside chemist shops. I had to drive over two hundred miles across the country in the middle of the night with the six foot fake panda wedged into the back seat of my car. In the shadows he looked very lifelike. When I was suddenly stopped by a police block due to a road traffic accident I’ll never forget the police officer’s look of surprise when he shone his torch into my car and saw a panda’s face staring back at him!